Rappel at Catarata Del Toro - 90-meter next to the waterfall. We want to inform you that from 2019 on we will not offer rappel anymore. This due to personal reasons of the management. Thank you for your interest and understanding and sorry for the inconvenience. 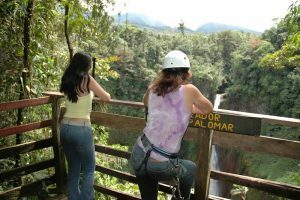 A 90-meter rappel next to the most impressive waterfall of Costa Rica and there is no other place alike in Costa Rica. While we are probably not the most popular one in Costa Rica but at least it is the most impressive. And definitely not for the faint of heart. Also, rappelling is safe and fun if it’s done under the right conditions. First of all: Our equipment is up-to-date. Second: You have to be in perfect shape, physically and mentally and with a maximum weight of 100 kg. Third: The weather has to be OK, because when it rains the waterfall increases rapidly and then the landing zone will be not safe anymore or even it will impossible to land. We prefer not to do rappel if those 3 requirements are not matched. But if so, you are welcome to make a reservation and we work with small groups preferable early mornings. Duration: 90-120 minutes including the hike back up. Requirements: You need to be in good shape: physically and mentally. Do not hesitate to contact us with your questions or remarks.